This model is the RBA Collectibles McLaren Ford M7C (1969) in orange McLaren Cars livery as driven by Bruce McLaren in 1969. 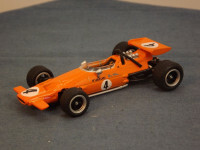 The McLaren M7A and its M7B, M7C and M7D variants were Formula One racing cars, built by McLaren and used in the world championship between 1968 and 1971. Designed by Robin Herd and Gordon Coppuck, the M7A was the first McLaren to be powered by the Cosworth DFV engine, which went on to be used by the team until 1983. The M7B had outboard fuel tanks and the M7C a modified chassis, whilst the M7D was powered by an Alfa-Romeo engine. 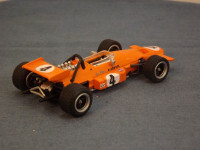 The chief distinguishing characteristic of M7C was its fully enclosed monocoque which gave greater torsional rigidity than the bathtub chassis. 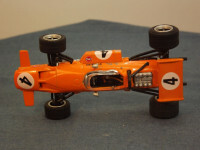 It was based on McLaren's M10A Formula 5000 car, which itself was derived from the M7A. Only one was made. [Taylor, William (2009) . Tremayne, David, ed. McLaren – The Cars 1964–2008 (Second ed.). Coterie Press. ISBN 978-1-902351-34-6.]. This model is probably from a Spanish or European partworks. 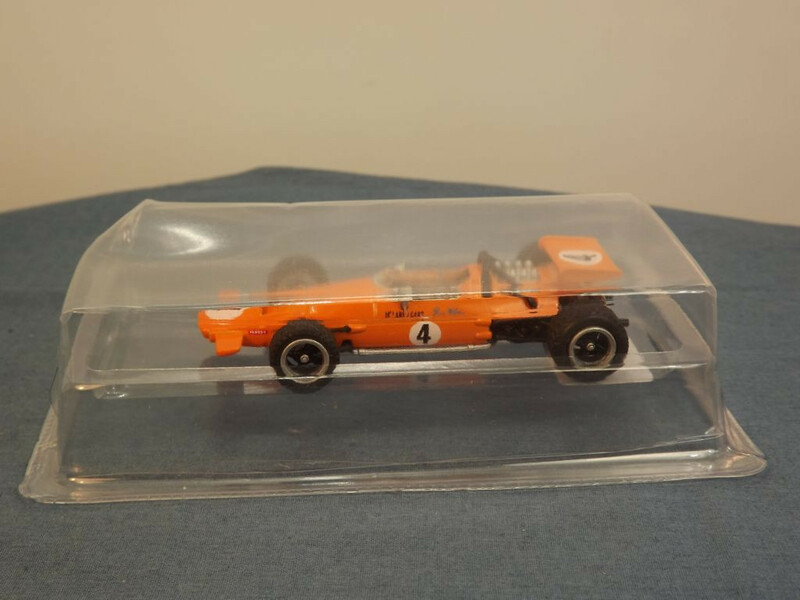 The body casting is basic, covering the general shape of the vehicle but with several additional plastic parts representing the mirrors, windscreen, steering wheel, seat, roll bars, engine and suspension making it much better than, say, the early Onyx models. It carries few logos (McLaren Cars, Gulf, Ferodo), has the racing number "4" in black on white circle, and carries the driver's name "Bruce McLaren" and a small black kiwi on both sides of the cockpit. The interior is set out with steering wheel and seat (possibly with racing harness in black). The glazing is clear on this model. 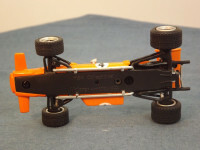 All wheels are of a "racing wheel" type - solid one piece, black and silver plastic, 4 spoke hub with a soft rubber treaded tyre. The base plate is black plastic and is marked at the centre top with RBA Collectibles and "McLaren Ford M7C - 1969" at the bottom centre. 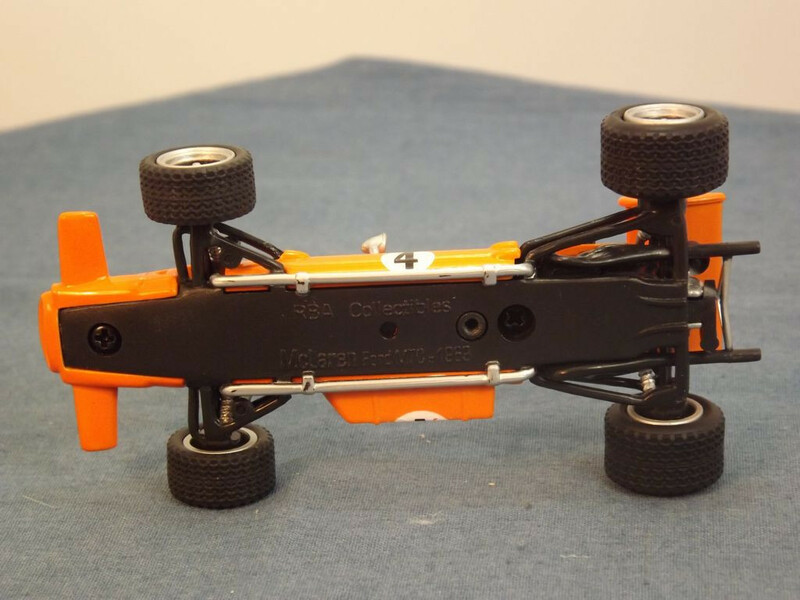 The base plate is held in place with two tiny self tapping screws, one front and one rear.